***Open House Sunday 12/9/18 1-3pm***Gorgeous lakefront colonial with finished walkout (add 2000 sf ).Former builders home with amazing quality. Solid oak doors, trim, judges paneling, etc. Huge deck overlooks lake. 3 full baths + sauna & 4th full bath in lower level. 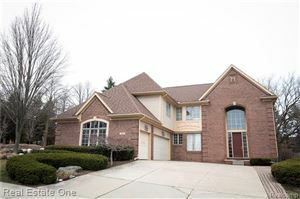 MBR w/jacuzzi & shower.Large curved oak bar, full kitchen, bath, rec rooms in w/o bsmt. Double furnace and AC. Utica schools.